This animated Adventure Series is Cartoon Network's update of Superfriends, with seven core heroes: Superman, Wonder Woman, Batman, Green Lantern, the Flash, Hawkgirl and Martian Manhunter. Existing in the same universe as Batman: The Animated Series, Superman: The Animated Series, Static Shock, The Zeta Project and Batman Beyond, this show continued several story threads from those series and introduced new characters who had not previously appeared. Banding together for the first time to face powerful alien conquerors, Superman, Batman, Wonder Woman, The Flash, the Green Lantern John Stewart, Hawkgirl, and the Martian Manhunter officially organize themselves as a team, anticipating having to deal with other threats that they cannot face alone. This incarnation lasted two seasons and 52 episodes (most of which were two-parters, with three three-parters and a single standalone episode). What immediately separated this show from Superfriends (aside from actual characterization and the writers' capacity to remember what the characters' powers were) was the decision to not feature every member in every episode. Between two and five members would have an episode together and only a couple of times did the entire League appear. The decision to also turn most stories into two or three part episodes allowed for a much larger scope that could not be accomplished in 22 minutes. 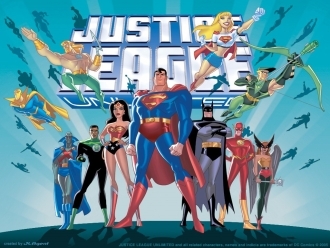 The successor series, Justice League Unlimited, added more heroes from DC Comics, many of whom had never before been animated. Instead of the two or three part episodes, this series returned to the single episode format, which allowed for the more obscure heroes to be spotlighted. To balance this out, a very strong Myth Arc was formed telling of a Government Conspiracy against the League, picking up from a few previous episodes. This incarnation lasted 39 episodes. To date, it comprises the last installments of the DC Animated Universe. For the comic this show was based on, see Justice League of America. See also Justice League: Crisis on Two Earths, which started off as a movie bridging the gap between the end of Justice League and the beginning of Unlimited. Though not set within the DC Animated Universe, the film retains many of the plot points and themes of the original story.